If you are experiencing a mouse problem, then you’ve come to the right place. This is the definitive guide for getting rid of mice. Before I get started though, I just want to let you know that you’re not alone. A recent survey published by the National Pest Management Association (NPMA) found that nearly one-third of Americans have had a rodent problem in their home – that’s approximately 21 million U.S. homes invaded by these little creatures every year. So it appears you’ve won the rodent lottery, now what? You’ve seen a mouse running across the floor (yes, I am “Master of the Obvious”). This is a usually pretty good sign you have mice. Rod-shaped feces that tend to be pointy and each ends, up to a quarter or one half inch in length. If the feces is rounded in larger, you may have yourself a rat problem. The image to the left demonstrates some of the features of rat vs. mice. If you hear mysterious rustling sounds that sound like they’re coming from inside the walls, or in the ceiling, this may be rodent mice making its way between food and its nest. You may also recognize what are called mouse tracks along the edges of walls near the floor. Mice are generally blind and will rub against the sides of the walls to maintain their orientation. Because the mice are dirty, you will often times notice dirt smudges along paths that mice frequent. This is a prime location to place traps, so if you recognize this feature take note of it. If you still can’t tell whether or not you have a mouse infestation, try this neat little trick to eliminate all doubts. In locations where you think the mice may be, sprinkle baby powder lightly on the ground and wait a few days to see if you see any footprints in the baby powder. Once you do that you can start to determine the intentions of the mouse by seeing where it’s going. This is also a great way to determine whether or not you have a mouse or a rat because the distance between the footprints will be different. Rats have a much wider profile than mice do. Getting mice in your home is normal, but oftentimes avoidable. Mice are primarily motivated by two things: food and shelter. As fall approaches and the temperature starts to drop, mice start to look for refuge in a warm area (your home) near a food supply (your home). What type of food are they looking for? Just about anything: pet food, cereal, grain, crackers, you name it. If they can get to it, they will eat it. You know mice like food – that’s why you bait a trap – so it should come as no surprise to you that the NPMA survey found that 50% of infestations occur in the kitchen. This bears repeating: half of all mouse infestations occur in the kitchen. You know how to stop this. Take away the food source. The best way to eliminate this food source is to store it properly. You don’t have to get rid of it completely, that’s nonsense. For example, if you have a large bag of dog food, don’t just set it on the side of the garage in the back. Mice will very easily chew through the bottom corner of the bag and have a virtually unlimited supply of food for the winter. Instead purchase a large, sealable plastic container and house the food in there. This one time expense of purchasing plastic storage containers will pay dividends when it reduces or eliminates your mouse problems. Don’t be cheap because you’ll pay for it later. If it’s too late, now you know for next time. 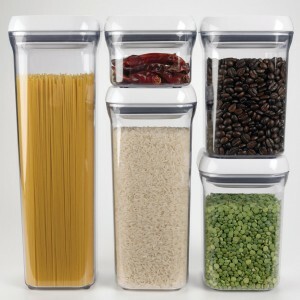 OXO Food Storage – Starting at $8.99! Cereal boxes are another prime target for mice because chewing through the cardboard sides is no match for their teeth. As a matter of fact, it’s extremely common for mice to shred cardboard or paper and use the material to form their nest. Once they’ve found food, mice will typically go no further than 25 feet from their nest. Keep an eye out in the pantry because food that is stored in there for a long time without much human traffic is mice heaven. It is also important to ensure that you maintain a clean household. Do not leave plates with food out in the open, make sure to immediately wash them. You’ll also want to take care to thoroughly clean countertops if you have a mice problem because they are known carriers of several diseases. If you find that a food source has been invaded by mice, throw away the food immediately – do not eat the food. You want to systematically go through your house and thoroughly clean anywhere food has ever been. Check under your children’s beds, look under the couch cushions, look behind the bar where you store your alcohol, just about anywhere food could be or has been, you’ll need to clean thoroughly and ensure food is no longer there, and if it is there make sure it is properly stored. The point of this step is to eliminate shelter for mice and remove their food source. This step will help prevent mice from coming in the first place. Another step you’re going to want to take after thoroughly cleaning everything is to remove all access points into your home. Mice are very small and nimble creatures and can fit through a hole the size of your pinkie finger. Look around pipes or other places where the exterior of your home is breached for some access (cable, water, telephone, etc.). For permanent fix use some kind of sealant, or if you’re looking for a temporary quick fix you can use steel wool or some other wire mesh. Mice cannot chew through metal, but they are able to chew through plastic, cardboard, or other soft materials. The point of this step is to eliminate access to your home or garage. It is extremely important that you isolate all possible entrances because if you leave just one this is all a mouse needs to get in. This is something you may want to do both inside and outside your home. Inside don’t forget to look under cabinets as this is a perfect place for a mouse to hide and breed. There are a lot of ways to get rid of mice. I’ll talk about a few of the common methods here, but this entire site is dedicated to helping you get rid of mice. The wooden snap trap is probably the most common mouse trap because it not only works, it works well. They work by simply placing some sort of bait on a trigger and when the mice goes to take the bait it activates the trap which snaps down and breaks their neck. It’s really simple how it works. You just lay several of these in the area where the mice are known to be, and they will hopefully take the bait if you choose the right one and they will die. The problem with this is that they can get messy at times – some people have reported that the mouse’s head has been snapped clear off, but this is rare. It is best to place these traps along the wall where you identified the mouse uses as a trail to and from its nest or the food source. Remember the mouse tracks that I talked about when you identify the signs of mice. If you don’t like the possibility of breaking the mouse’s neck to kill them, you can try deploying some of the electronic mousetraps that are on the market. These work in a similar fashion in that there is a bait placed in the electronic trap and when the mouse tries to take the bait it closes an electrical circuit that induces a fatal electric shock. Some people may find this inhumane, the most electronic traps subscribe to the international humane kill standards. Another nice thing about this trap is that it can be used to kill many mice, but if your home is overwhelms you may need more than one. There are also a variety of live catch traps on the market that work by luring a mouse into a container that has a one-way door. The mice can get in but the mice cannot get out. Some people prefer this method as they do not feel comfortable killing the mice or handling the dead mouse. They like this so they can catch and release it back into the wild. Of the problem with this is that mice have an instinctual homing beacon that will bring them back to their nest. If you do choose to catch and release them anyways, make sure that you release them at least 1 mile from your home otherwise you may find that they wind up on your front porch again. There are numerous mouse repellents on the market. Some of the most common you’ll run into are the ultrasonic mouse repellents. These devices work by emitting high-pitched frequencies beyond the human hearing that are threatening to mice. One of the sounds they mimic is the sound of a dominant male and because of the territorial nature of mice they will move onward and look for another place to stay. People have reported varying levels of success with these devices, but it is my belief that the most common source of failure is the improper usage of the device. It is important to deploy these devices such that the sound they emit extends out into the zone from which you’d like to repel the mice. The most common problem with this device is placing them behind furniture in which the sound is absorbed, or purchasing a device that is too small to cover the desired area. Note that if you have any sort of rodent pet such as a gerbil, hamster, or other you will not want to use this device as this will essentially be torturing your beloved animal. It is safe to use with other household pets such as dogs and cats. Another thing that doesn’t mix very well is peppermint oil and mice. Mice detest the smell of peppermint because their noses are very sensitive and the scent of peppermint is extremely strong. The scent overwhelms them and helps to prevent them from entering the treated area. Many people think that mouse poison is the easiest way to get rid of mice because it is simple and effective. While this is true using mice poison is dangerous to your own pets and other small animals such as squirrels or your neighbor’s pets that may come across and eat the poison. Another problem with mouse poison is that when the mice either they do not die immediately. Usually when a mouse has finished eating he returns to his nest. Once the poison kicks in, he will die… most likely in his nest… Which may be in the wall of your home. That means the mouse will start to decompose in a location that is inaccessible to you and begin to emanate a putrid dead mouse smell. The thing you lose when deploying mouse poison over standard mousetraps is control – control over where the mouse dies. Next Article Do Mothballs Keep Mice Away? We have had traps and poison for our infestation. Both have been successful as we caught a few in the traps and poison has been taken. Also we no longer hear any mice. HOWEVER! We have not been able to use the part of our house where most of the mice were for four weeks because of the most disgusting putrid smell. We were told poison is best way as traps only kill the adults, not the babies, but we weren’t told about the smell. Its foul. I have found where mice are getting into my garage. Before I seal the access, how can I be sure all mice are out of the garage. I certainly don’t want to seal them in. Your best bet is to actually seal off any access to your home as soon as possible. Then set traps to catch any mice that remain. If you leave the access point open, it may invite other mice to come in. The mice that are there aren’t going to leave, especially if they’ve already made a nest in your home. Mice don’t tend to stray very far from their nest. Once they’ve planted themselves, they will stay nearby unless their habitat becomes inhospitable (traps, mouse prevention techniques, remove the food source, or they die). Sealing off the hole may prevent them from getting to their food source, and if they’re out and about, may prevent them from coming back. If they’re already there, you’ll have laid out a few traps to ensure that their home isn’t so welcoming. Also, and this is most important, eliminate the food source! They can’t survive if they can’t find food! A mouse that dies from poison does not smell. The poison causes it to quickly dehydrate. However, the danger to pets as the mouse searches for water while dehydrating is very real. I posted the previous comment because it brings up a good point, even though the first half is partially untrue. While poison does indeed work by dehydrating mice, it is not possible to dehydrate a dead carcass so quickly that it will not emanate any fould stench in the process. The decomposition process may be slightly accelerated, but the threat of smelling a dead mouse after using mouse poison is not just a possibility, it’s a very good probability. If you find yourself talking to a mouse exterminator trying to sell you on poison that is guaranteed to not leave you with the smell of rotting mice, you should find a new exterminator… OR better yet, get him to put that into writing with a money back guarantee. If you get him to do that, let me know how it works out for you. The other half of the comment, the fact that poison is dangerous to pets, is absolutely true. If you have pets (or even small children), don’t use mouse poison. There is the possibility that they might get into it and eat it, or as Anonymous pointed out above, a pet may catch a dying mouse and ingest the poison second hand. Either scenario is not a good one. it sounds like we have mice in the ceiling of our basement but have not found any droppings anywhere in the house where there may be a food source. Will they just die in time? Not likely… mice don’t go away on their own. As a matter of fact, if you ignore the problem it is likely that it will actually worsen. The more time mice have, the more time they have to reproduce… if you know anything about mice, they don’t have one or two babies. We’re talking on the order of a dozen or more. Then a small mouse problem that is containable turns into a full fledged infestation requiring professional help. If you believe you have mice, you need to immediately take steps to eliminate them. Check out some of the suggestions on this site and go get yourself some mouse traps! we use the green blocks all over the house against the walls. Probably a total of 20 traps altogether. I also have one of these sound emitters in the basement as well. i have no way of getting the traps in the ceiling since it is a drywalled ceiling. My only hope at this point is that it comes down and finds one of the traps. You really need to try and identify their access point. When you hear the footsteps in the ceiling, try to trace in which direction they are heading. Mice can find a hole in the wall or around pipes, and they will climb up. They could even be passing through the ventilation system. If you can open up a vent, you might want to try placing a couple traps there to see if you can lure them in that direction. One thing to keep in mind… the ultrasonic mice repellents lose their effectiveness the farther away they are. As the sound gets absorbed by various objects in the home, it’s not as loud, and consequently not effective. For a mouse in the walls, the effectiveness of the ultrasonic trap is lessened even further since it has to pass through the drywall (just like it’s harder to hear someone when they’re talking from another room in the house). For mice in the walls, you may want to consider a different solution: Pest Offense Electronic Pest Repeller. This actually sends electronic impulses through your home wiring (which is run through your walls). This may be what you need to drive mice from within your ceiling. Depending on the size of your home, it may require that you get a couple of them, as the further you get from the device, the less effective it will be. It says that one unit is good for one floor of an average size home. You’ll want to make sure your entire home is covered. You want to force mice out, not move to a different room. Ultimately, the mice need food to survive, so they’re going to have to come out to find it eventually (either that or they’ll die, in which case you have dead mouse smell to worry about). You just have to be certain that the mice aren’t coming and going as they please through some hidden access point. That’s when you’ll have real problems and risk a full fledged infestation. Also make sure you’re using peanut butter on at least some of the traps. Perhaps some cereal on others… bait variety is good. It’s also good to use various types of traps… try some snap traps, try some live catch traps, and try some electronic mouse traps. What may be effective against one mice, may not work so well against another. Finally, if the problem persists, you may need to call in a professional exterminator. He may recommend busting through the drywall and patching it back up, so be prepared for that. Of course you’ll want to use that as a last resort… When it comes down to it… the mice are getting in and out somewhere – you just need to find out where that is. Hi, so I combined two things. I took some of the green blocks and covered them is peanut butter. I then threw them into some places in our furnace room where there is small access to the ceiling. After about a week, all the footsteps are gone!! Now I just need to figure out where the access point is. We are planning on drywalling our attached garage and have started putting our garbage outside instead of in the garage. The size of the poop tells me it’s mice poop. About3/8″ long and 1/8″ diameter. However, there is absolutely no food out there (unfinished apartment over detached garage, no kitchen yet). And no food nearby. Closest food is inside house, which would be about 100 feet of travel for them. So, could it be a rat? What would trap a rat? Any tips for getting mice out of my car engine? Will moth balls do damage to my engine parts? A mouse just chewed through a wire in my husband’s car to the tune of about $200 to replace. Would love any feedback. It is not uncommon to have mice in your car. I’ve been meaning to write an article about this for a while. One of the primary reasons they go there is because after you have driven around and park in the garage (or wherever), the engine is still warm. On cooler days, this is very attractive to mice. If you have mice in your car already, there’s a couple things you can do. Mice are looking for a two things primarily: food and shelter. First thing you can do is move your car. It’ll be inconvenient for a while, but try parking it elsewhere … maybe at the end of the driveway or if possible, on the side of the street. The further you can park from where it is now, the better. Mice will tend to stay in a localized area, so if you move the car from this area, they at least won’t be in your car any more. Next thing you have to do is eliminate their source of food. Clean the area thoroughly. Make sure all food is packaged in sealable plastic containers (especially dog food). If your car is dirty, clean it thoroughly. Don’t leave any food in your car… ever. All you’re doing is creating mouse paradise… nice warm shelter and a good source of food. Draw them out using bait and traps. My favorite traps are the Snap-E Mouse Traps. The best bait to use is peanut butter. The traps are easy to bait and set. Not only that, but they are effective, and it’s easy to dispose of the mice when you catch them. In the end, whether the mouse is in your car or the house, the tips on this site should help you get rid of the mice. If you believe the issue is getting too serious to handle on your own, I’d recommend calling an exterminator. If you’re still willing to go the do-it-yourself way of getting rid of mice, I have a couple more suggestions. First, you need to seal up all food sources. Leave nothing open or accessible. A cardboard box or bag is not good enough. It needs to be sealed in a plastic container, something mice cannot chew threw. Second, it sounds like you’re using traps, but perhaps not the right bait. Are you using peanut butter? If not, start using that… they’re not avoiding the traps, you’ve just been unsuccessful at luring them into the traps. Third, trap placement is important, as is the number of mouse traps you set. One or two is not enough. You need around six per room. Place them near their food source. Have you figured out where they’re coming from? Place traps there. If it looks like they may be coming from outside, seal that entrance. Finally, if you don’t know where they’re coming from, try spreading flour on the floor. When mice walk across it, they will leave tracks. This should help you sort out their routes. When you figure that out, put traps there as well. We have no mouse poop anywhere and yesterday at 7am we found a mouse alive in the bathroom it ran then about 230 pm one crawled in the living room I caugt it and killed it. So we think it came from our finished basement sp we looked found no mouse poop down there. Then my husband moved the ceiling tilesand found a dead one and tons of poop plus a nest. We gpt rid of the mouse and neat and r going to kill the poop tonite. Im freaking out, I a clean freak. we set sticky traps last night up there. Im hoping this is it. Im just not sure where they came from. The nest was at the oposite end of the poop. How dp I know if thats it. I also have an attached car garage. That’s always a tough question to answer… how do you know when you’ve actually gotten rid of all the mice? Unfortunately the answer is you stop catching them and there no longer any signs of mice. You’ll have to check thoroughly throughout your home for signs of mice. Just because you don’t see them in your kitchen doesn’t mean they’re not hiding in your walls, or in your garage. You’ll have to set traps out all around, and then hope that you get rid of them all. You’re taking the right steps. Just make sure you take some of the preventative actions I describe on this site to make sure that once you get rid of them, they’re gone for good. so we have a tile roofing where you can push up each tile, we have been hearing running through our roof the past month or so, we live in a 3 room (bedroom, living room, kitchen) apartment, what is the best way to eliminate this problem? Since it sounds like you have access to the area, your best bet is to set a trap or two in the ceiling. Make sure to check the trap at least daily! The last thing you want is to catch a mouse and have it start to decompose… the smell is horrendous! If checking the traps in the ceiling frequently sounds like an annoyance, there is a pretty nifty design that can simplify that for you. It’s called the Agrizap Rat Zapper. It’s an electronic trap that delivers a fatal shock to the mouse when it enters it. The neat thing about this trap is that it has an extension called the rat zapper tail that lights up when there’s a mouse in the chamber. You can put the trap up in the ceiling, while running the tail to a place that you can easily check. When a mouse is caught, it lights up and you can empty the trap. If you haven’t caught a mouse yet, there’s no need to check the trap frequently because the light will tell you. I think it’s pretty cool and could work well for the drop down ceiling tiles that you describe. In any case, whatever trap you set, I recommend using peanut butter as the bait. Don’t put too much on there. Just enough to get the scent and attract the mice. I have been noticing mice on my house more since it got cold outside. I have bought several of those snap traps and all the mice keep stealing the bait but not setting off the trap. I’ve tried peanut butter, chips, cerael and my husband even glued the chips to the trap and they still steal the food without setting the trap off ,so how do I catch them? I’ve been just waiting till my cat finially catches them, but they are so fast that its hard for my cat to catch them. And I’m afraid that the mice might make my cat sick if its a sick mouse. Help these mice are smarter than the traps. When baiting the traps, make sure you’re not putting too much bait on there. When using peanut butter, it should not be a big glob, but more of a smear. You just want to give the mice a scent of the bait, not a free meal. The other thing is that the traps that you’re using may not be the best. If the traps aren’t triggering, then the mechanism may be too stiff. If they’re trigger too quickly, that one do the job either because the mouse won’t be in position yet. I’m not sure which way you’re having problems, but in either case, it’s usually down to the trap you’re using. One of the best reviewed traps on amazon is the snap-e mouse trap. People seem to be reporting good success with them. Hopefully that helps, and if you have any other questions, please feel free to ask away. Just heard scratching in our drop ceiling and i’m panicking. unfortunately the type of tiles we have are immovable. We had an exterminator out a couple of years ago when we heard mice and they told us there was no way to get at them there. now it seems whenever it gets cold they return, i thought we were going to make it through this winter without them but their definetely back. Please help! … for one, you might want to consider a different exterminator this time around. You may have better luck with someone else’s service. My other suggestion is this … the mouse have to be getting in from somewhere. You just need to identify where that somewhere is. Sometimes that’s easier said than done, especially since mice can fit through a hole the size of your pinkie. If you can somehow identify that location though, I’d recommend setting a couple traps to hopefully get rid of the mice, and seal the hole! Look around any access points to your home (water pipes, electrical, cable, etc…), cracks in your foundation, even cracks higher up. Mice are incredibly good climbers. The other thing I should say is that mice need food to live, and they need shelter. Right now your home must be providing both because otherwise the mice would not survive. Look for signs of mice near any types of food (this includes pet food that may be stored in the garage or other places). Mice don’t need much food to survive, but they need to eat something, so eliminate the food source. Seal things in plastic containers. If you take away either the food or the shelter (preferably both), they won’t be able to survive. The First main reason WHY mice nest in and around your car engine, is because the mice feel the warmth of the engine, from right after you arrived from somewhere and parked it for the night. The Best idea is that you can Plant some bait blocks under the hood somewhere, where they are Not near the engine. Like behind the window washer fluid container, or anywhere else where there is a pocket to tuck the bait in. Sorry to hear you’re having so much trouble with mice … it happens to be the case that in densely populated areas, rodents tend to thrive. People are naturally dirty creatures, and the rodents are always going to be around to pick up the scraps. That being said – it sounds like you’re doing the right thing. Keep up with the traps, maybe even set more. I’ve also talked about the Victor M260 Multi-Kill Mouse Trap on my site. It’s expensive, but it might be what you need in order to catch multiple mice with a single trap. The problem with being in a multi-dwelling unit is that you can do everything right, but still suffer from mice because of your neighbors. It’s frustrating, but keep setting the traps and hopefully you’ll be able to get out ahead of it at some point. Also, I generally tend to advise against poison. That could lead to dead mice in the walls which will inevitably unleash an ungodly smell that’s almost as bad as living with mice running along the floorboards. Hi. I have a Guinea Pig and a dog. The mouse that ran into my foot twice trying to find shelter(my guess) came from the one vent we’ve had a mouse nest in before. I have all the traps mentioned. I have killed several on my dining room table. The “dining” room is part of an open kitchen with an island dividing the kitchen and dining area. My Guinea Pig lives in his cage under the bar area of the island near the dogs water and food. I want to try the peppermint but fear it may make my Guinea Pig crazy. I have successfully thwarted the mice from visiting under the sink but now have in my mobile home in bedroom closets. I know I have to figure out how to get under the dishwasher and seal those holes. Do you think it would be safe to put the peppermint oil in the bedrooms and snap traps in the dining room (and the counters in the kitchen)?